Shea nut butter, vitamin E and aloe vera combine with sulphate free foaming cleansers and ground walnut shells to exfoliate dry, hardened and difficult to clean skin. Certified cruelty free. 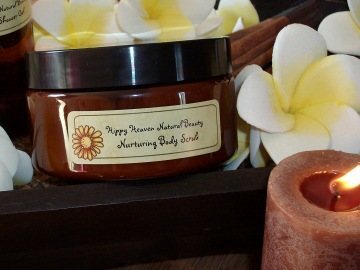 Hippy Heaven Super Cleansing Walnut Scrub removes deeply ingrained dirt while soothing and moistursing for healthy looking skin. The skin is left moisturized and thoroughly cleansed. Wonderful to deeply cleanse the hardworking mans skin! Hippy Heaven’s essential oil blend for energy contains oils including rosewood, peppermint, lemon myrtle, lime and more. An invigorating, earthy scent with citrus undertones, perfect for every day.